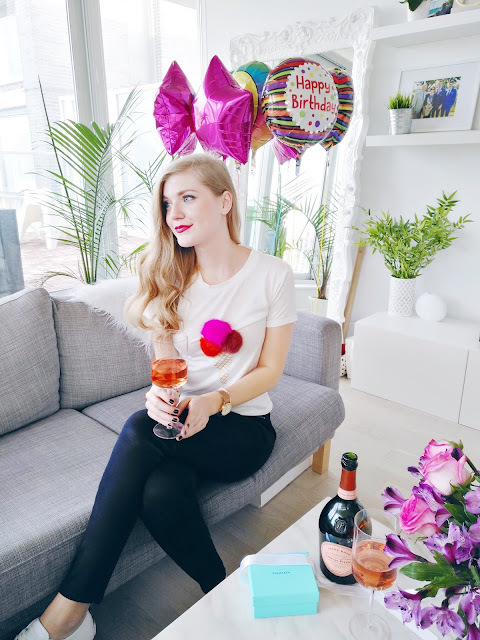 I celebrated my birthday on April 22 and it was spent exactly the way I wanted it to be. Although it may look like I had a big party with my decor, I ended up staying in, eating pizza and watching movies. I know when you turn 25 you're suppose to go out and party, but I'm a major homebody and spent it with Shawn. Shawn has been traveling a ton with work, so luckily he flew in the morning of my birthday and we could spend it together. 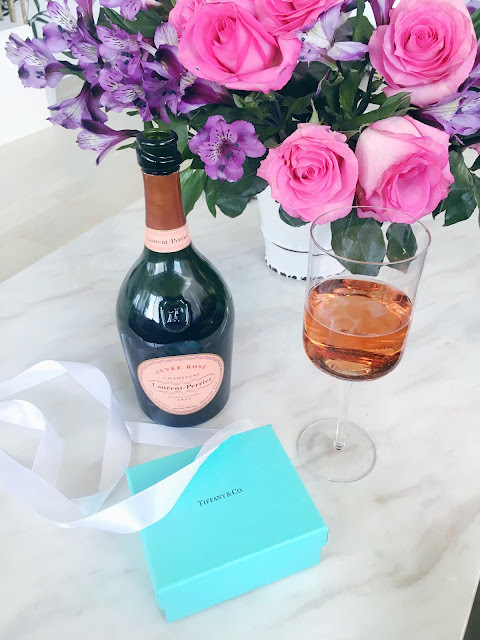 Shawn picked me up some Rosé Champagne, a delicious bottle of red wine and a cute Tiffany&Co. present. It actually isn't jewelry, but a cute Tiffany's blue card holder. He always gets mad at me because I just throw my random cards into whatever pocket or purse I'm using at that moment. As you can imagine by doing this, I lose a lot of cards. It drives Shawn crazy so he went and bought me a card holder. He is always the most thoughtful when it comes to gifts. If it was socially acceptable to have balloons in my house 24/7 I would!! Classic Tim Horton's donuts for my cake. It's also a tradition to have breakfast in bed for my birthday and the more sugar, the better. I just wanted to thank everyone for the sweetest birthday messages. You honestly know how to make a girl feel special. I tried to thank everyone individually, but If I missed you I SERIOUSLY appreciate it the messages!!! Happy birthday to you and may you have a billion more. I just loved the decore . It is so well coordinate and every thing falls in so well. Love those beautiful flowers and cake.